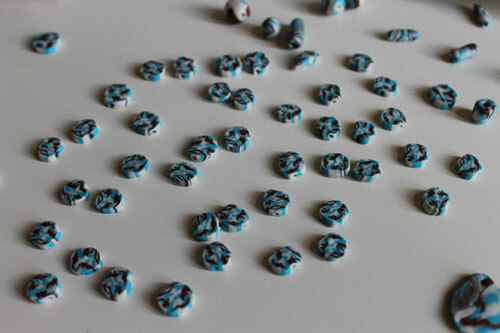 Have you ever seen polymer clay beads? They’re absolutely beautiful! 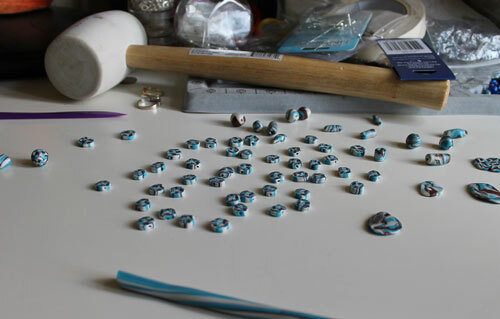 And there is NO shortage of tutorials online that show you how EASY it is to make your OWN beads! Make my OWN beads? Okay! Which is how I found myself with three blocks of Sculpey clay and a free afternoon. I took 1/4 of each package (chocolate, turquoise, pearl) and rolled them into long rolls, called canes. Then what you’re supposed to do is cut the original cane into thirds, fourths, fifths (or whatever), combine them into a new cane and then use a razor to slice them into lovely beads. Poke a hole in them, bake’em for 15 minutes and you have beads! Of your very own! My first mistake was getting the colors twisted around when I was rolling my canes. So I didn’t have a pretty symmetrical inside to my bead. Whatever. I love the combination of brown, blue & white so I was happy to have these beads no matter what. 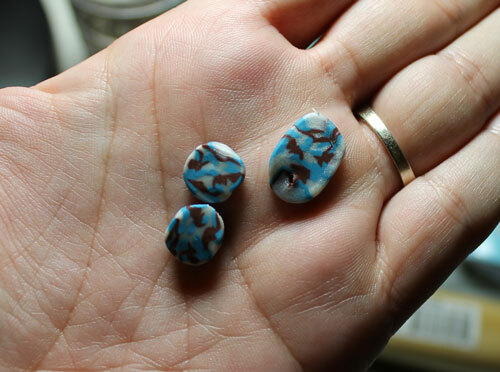 And they looked a bit like brown & turquoise camouflage. My second mistake was underestimating HOW MANY BEADS come from 3/4 of a block of sculpey. About 12 slices into this project I could feel my happy mood deflating. See the cane in the foreground? I still had that many to cut. My third mistake was not letting the beads settle and cool down a bit before trying to poke the holes. Because of that, the beads got all smushy when I tried to push my safety pin through, and some of the beads have enough of my fingerprints in them that you could use them to implicate me in any crime you want. This is the project that never ends. Yes, it goes on and on my friends. And my final mistake, which was actually mistake .5 (mistake zero being THINKING THAT I COULD MAKE BEADS IN THE FIRST PLACE) was purchasing the pearl clay instead of white. Sculpey pearl, when baked, turns into a glittery translucent white, which really muddied up the final color of the beads. Having a pure white would have made them look crispier. Unfortunately, I discovered mistake .5 after spending two and a half hours slicing and poking clay, and 15 minutes baking the devil beads. This is what it sounds like when crafters cry. My takeaways from this? Never trust the internet. And just buy beads. Does anyone want 3/4 of a block of chocolate, turquoise and pearl Sculpey?